The international paper size standard, based on the German DIN standard for paper sizes. A0 posters 841mm x 1189mm. or 33.1" x 46.8"
A1 posters 594mm x 841mm. or 23.4" x 33.1"
A2 posters 420mm x 594mm. or 16.5" x 23.4"
A3 posters 297mm x 420mm. or 11.7" x 16.5"
A4 posters 210mm x 297mm. or 8.3" x 11.7"
All of these paper sizes are related to one another - Successive paper sizes in the series A1, A2, A3, and so forth, are defined by halving the preceding paper size along the larger dimension and rounding down. (Technically speaking they all based on a single aspect ratio of square root of 2, or approximately 1:1.4142). 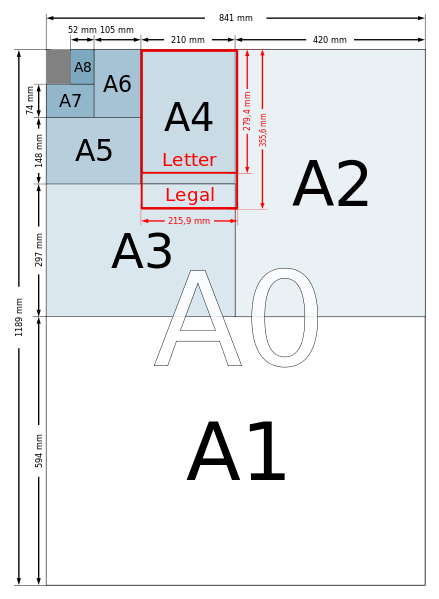 Poster-size-infographic illustrating the DIN A series of paper sizes and the 'Letter' and 'Legal' Sizes.